*“According to the land registry office in Orangeville, six homes in Dufferin County [Ontario, Canada] have been purchased by wind developers after serious [health] complaints. Most recently June 26th, 2009, the Barbara Ashbee home. 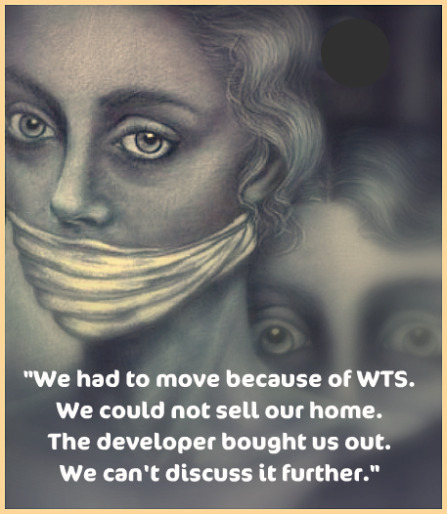 “Before these families could escape the nightmare of their unliveable homes, they had to agree to sign strict nondisclosure contracts—in other words, gag-orders to protect the wind companies. The wind company has spent over $1.75 million dollars clandestinely buying out these people, yet it claims there were no [health] complaints. “This list of residents is not yet conclusive. “Industrial Wind Turbines were allowed to be sited too close to residences. This caused severe noise and adverse health affects including cardiac arrhythmia, sleep disturbance, fatigue, increased stress levels and loss of cognitive function. “Their homes became unfit for human habitation. The purchases by the wind developer are an admission that wind turbines have created health issues that impact residents. No one shall be subjected to arbitrary interference with his privacy, family, home or correspondence. . . . Everyone has the right to the protection of the law against such interference. *Reprinted from Wind Concerns Ontario, with appreciation. I have a turbine in my backyard here in Falmouth, MA. 1.65 MW, privately-owned, and making money. I want to die at times because my little dream home is now almost unliveable some nights, and my property value is zero. I can’t afford to move and work here at home. I seldom sleep, and I shake, and my ears ring whenever I am home. Two years ago, this place had a market value of $600,000. We still have a bit of a mortgage on it, and 7 more years until any sort of hope for retirement. Talk people! Please! This will be like “asbestos” in the future. Of course, I will be dead by the time these money-makers are called to put health before profits.